Casio Fx-9750Gii Is Stuck! Help! So my calculator is stuck on the menu screen, and even if I take out the batteries and put them back in, it still shows the menu screen. NO keys are working, and I cant move in between the menu. Everything is stuck and no way to get it back to normal. I tried changing batteries and resetting using the reset button, but nothing is working! So basically it stays stuck here, and nothing happens, no keys work. My calculator was not used for a month and now when I try it does not work. Please help on how to fix this. Does inserting the USB cable (while having the other end attached to your computer) do anything? I have not tried that..will it make a difference? 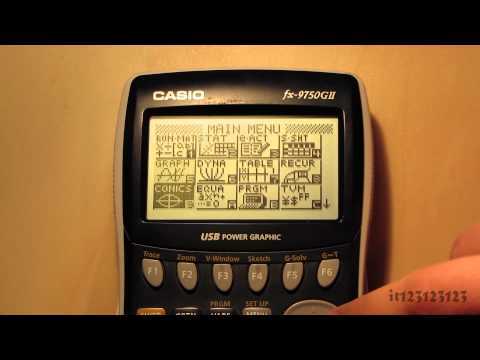 Can I flash stock factory file on the calculator using computer? Yes you can, and if you insert the USB cable it might auto-wake and let you use the keys. Edited by flyingfisch, 10 December 2013 - 09:51 PM.